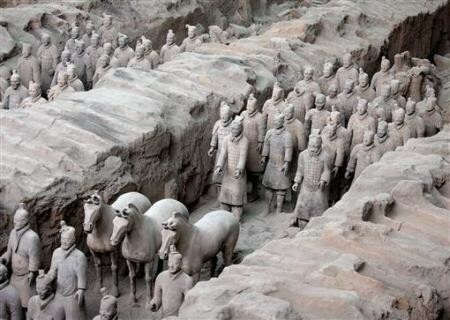 China's army of terracotta soldiers are buried in the ancient Chinese capital of Xian. Archaeologists at the Shaanxi Provincial Institute of Archaeology have found the remains of an ancient imperial palace near the tomb of Emperor Qin Shi Huang, (221 BC – 210 BC), the first emperor of China. The palace is the largest complex discovered so far in the emperor’s sprawling 22 square-mile (56 square-km) second-century BC mausoleum. Archaeologists believe that this palace is a predecessor of the forbidden city, the imperial palace in Beijing , which was occupied by emperors during the later Ming and Qing dynasties. Both were built on north-south axes in keeping with traditional Chinese cosmology. Qin began designing the palace for his afterlife shortly after he became king of the Qin state, aged 13. The complex took 700,000 workers about 40 years to build and was completed two years after his death. Chinese historians portray Qin as a great unifier, but as a ruthless leader.